Support the LCO and have a great dinner on May 7. Visit Panera, 520 W 23rd St., from 4-8p.m., show a printed or electronic version of this Panera fundraiser flyer and the LCO will receive 20% of your purchase. Thank you for your support and we hope to see you on May 7! What do you remember about the first time you conducted a performance? 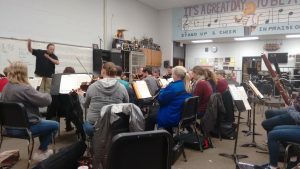 My first conducting experience was as the student director in high school; I had the conducting bug since I was a freshman. I didn’t want to be the drum major, but I conducted some pep band the big “break” was conducting our spring musical, “A Chorus Line.” Since it was a musical, we had multiple performances. But more of the memories involve the preparation and collaboration involved, in addition to the performances. That’s one of the great things about conducting – it requires people! The next formal conducting opportunities came as a student teacher after having conducting courses in college. Do you have a favorite/lucky baton? I have a handful of batons, but have almost always used one in particular since it was made for me about 20 years ago at a conducting workshop. There are some excellent baton makers out there, and hand-crafted batons can run anywhere from $30 to hundreds of dollars. Who’s your favorite conductor and why? The work of Carlos Kleiber has almost a cult following among many conductors, and I also enjoy watching videos of Leonard Bernstein and Gustavo Dudamel. While some may differ on Bernstein’s interpretations, these three conductors really draw out the energy in the music. How would you describe your conducting style? Interesting, I’ve never considered this question. I’d like to think that I attempt to set the atmosphere through gesture, and it’s a humbling art. What’s been your favorite LCO conducting experience? It’s hard to pick just one, so I’ll give three. Beethoven #5 (our first concert in our new community orchestra format), Dvorak #9 “From the New World” (overcoming some musical challenges as an ensemble in a short amount of time), and our most recent Elgar “Enigma Variations.” It’s amazing to share in the growth of the orchestra, and we can all be proud of the LCO and what is has become, and continue in its skyrocketing direction as an ensemble. When I am not playing the harp, I am usually running my kids to lessons, soccer practice, dance class, or making their Halloween costumes! Read all news . . .
Sunday, May 12, 3 p.m.